Reports of the ongoing volcanic eruption on the Big Island of Hawaii have been upsetting and dramatic. So far, the spewing and oozing lava from Kilauea has destroyed hundreds of homes and obliterated a scenic bay once popular for snorkeling. Near the volcano, residents have evacuated, not just because of the lava itself, but also because of air filled with ash, hydrochloric acid, and even particles of volcanic glass. The destruction has many mainlanders wondering if they should avoid making Hawaiian vacation plans this summer. Clearly, if you had plans to tour the volcano, you'll have to change your itinerary, since most of Hawai'i Volcanoes National Park is closed. 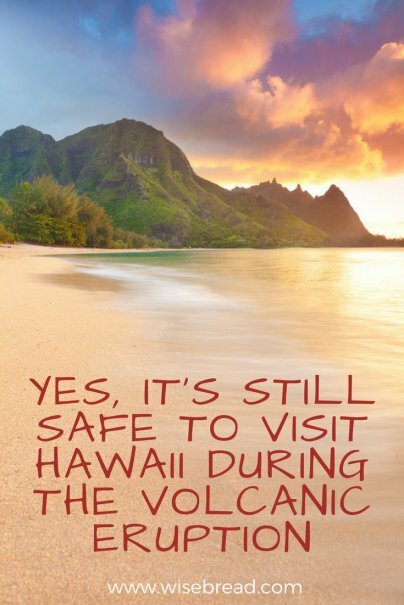 However, most of the Big Island and the rest of the Hawaiian Islands remain safe. Before leaving on your trip, you can check the Environmental Protection Agency's AirNow website or its interactive Air Monitoring Viewer, created to track air quality during the eruption. The combination of ash and fog is referred to as vog, and although it's usually not dangerous, it can ruin a sunset. "Consider Kīlauea has been erupting for 35+ years — with ocean entries on several occasions. Vog is, therefore, not something new. However, with the current increased activity, [it] may be more visible than normal depending on wind strength and direction," the Hawaii Tourism Authority states. It's certainly wise to look at a map of the volcanic activity to find out how far your chosen lodging is from the evacuation area. You can also check with your hotel or host. Officials are urging tourists not to try to get close enough to see the lava flow, for their own safety and to avoid further straining public safety resources. But chances are, you'll be staying miles away from the danger zone. Most hotels are in Kailua-Kona on the island's west coast or Hilo on the east coast, about 30 miles north of the lava area. The lava covers less than 10 square miles, or about 0.2 percent of the island. "Let's put this into context," said Hawaii County Managing Director Wil Okabe in a news conference. "All the islands in the Hawaiian chain can fit on the Big Island." He blamed the media, and confusion between the island of Hawaii and the state of Hawaii, for giving some mainlanders the impression that all of Hawaii is affected, instead of a tiny portion of one island. While there is no bad time to visit Hawaii, many people (other than surfers) prefer June through September, when the ocean is warm and calmer than in winter months. There is also a lower chance of rain than in October, November, March, and April. Tourism is the largest single industry in Hawaii's economy, and on the Big Island, 30 percent of private sector workers are employed in tourism. The Big Island is already suffering due to the closure of the national park and because some cruise ships have stopped calling there. "There are cancellations of vacations that affect the economy," said Okabe, who worried that mainlanders seeing volcanic eruption images in the media and on social networks were deciding not to go to Hawaii. Officials say the effect on tourism revenue going forward will be difficult to predict, but the Island of Hawaii Visitors Bureau is projecting a potential 50 percent decline in business. Even more worrisome, some travel companies report that bookings to the entire state of Hawaii have declined, even though the other islands are not at all affected by the volcano. It's not clear whether volcano fears will lead to discounts for braver tourists this summer. But at the moment, July airfares from San Francisco to Kona, for example, look low — starting at $268 round-trip — compared to July averages in the $800 range, according to Kayak.com. Flights from the Bay Area to Honolulu can be had for as low as $258 in July. Whether or not you save money, you might enjoy fewer crowds, especially if you visit the Big Island. Fewer cruise ships calling at the ports of Kona and Hilo and less-full flights landing at the airports could mean more beach space for you — something to keep in mind especially if you're the type of traveler likely to be annoyed when a large ship pulls in. And if you think it's unseemly to head for an island enduring a natural disaster just to have a less-crowded holiday, consider all the people on the Big Island who rely on tourism to put food on their tables. They'll be happy you came.